The 2019 edition of the Miami Open is set to begin March 18-31 starring some of the world’s greatest tennis players. But the location has changed. This year it will be set in Miami Gardens at the former Native American burial site currently known as Hard Rock Stadium. But for the last 31 years the event once known as The Lipton (and close to a dozen other corporate sponsored names) was held on Key Biscayne. We can’t let the tournament relocate without some acknowledgement of the great tennis held on the barrier island. And so we present this list of the five best matches ever played on Key Biscayne. This was a three set battle between local favorites. Chris Evert, America’s sweetheart, was born in Fort Lauderdale before going on to win 19 Grand Slam titles. At the time of the match Evert was 34 and months away from retiring when she faced the Argentine Sabatini who trained on Key Biscayne. The first two sets were split 6–1, 4–6, but the teenaged Sabatini had too much energy and overpowered Evert in the final set 6-2 for her lone MIami title. Hard as it might be for kids to believe, but there was a time when American men dominated tennis. Jim Courier, Michael Chang, Todd Martin would all make it to the late rounds of tournaments. But the real heavy hitters were Agassi and Sampras who combined for 22 Grand Slam titles. 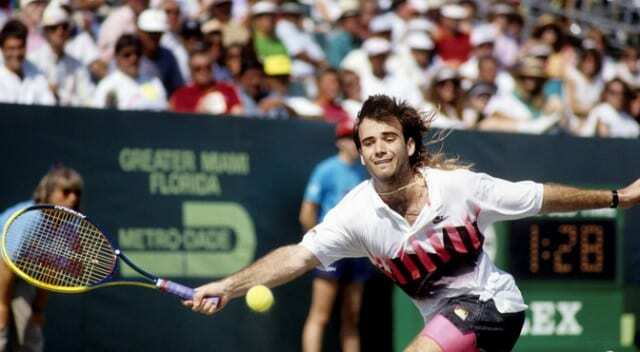 In this epic best of three sets match Agassi had the better day winning in a third set tiebreaker 3–6, 6–2, 7–6(7–3) to take home his third of six Miami titles. This feels like a long time ago. Before either Williams sister won a Grand Slam and back when Venus was considered the better player, the sisters met in the Finals here. It took all three sets to decide which Williams sister was the champ. Venus won 6–1, 4–6, 6–4 for her second straight Miami title. Don’t cry for Serena, she went on to win the tournament a record eight times. As a sign of things to come for what many consider tennis’ greatest rivalry, the two men with the most Grand Slam titles faced off at a relatively young age in their first ever final’s match-up. This was the only five set final in Key Biscayne history. Nadal had the early lead winning the first two sets, but Federer outlasted him as he was prone to do during his peak winning 2–6, 6–7(4–7), 7–6(7–5), 6–3, 6–1.